Generally speaking, EUU Logo is described by the letter e (Esa) which is formed by 3 (three) curved lines with a three-dimensional blue ball in the center. Two curved lines are blue, while the other curved lines are orange and form the letter u (Unggul). The entire logo element forms a simple (simple) formation, so that it is easily recognizable. electronics, describing university trips to enter the e-learning-based digital era. ultimate, represents an attitude and effort to achieve “completion”. The three curved lines that make up the rounds in spiraling motion, illustrate the dynamics of the university to continue to progress without stopping, breaking the boundaries of establishment, achieving its noble goals and ideals. The three-dimensional blue ball located in the middle of the dynamic vortex illustrates the “focus” and the university’s journey to achieve success and dignity at the global level (internationally). A beam of light on the blue ball illustrates the presence of the institution’s reputation by institutions and graduates that will give its own meaning, value and color to the university or humanity. Blue, representing the institutional attitudes of the university and academics who are open to renewal, new paradigms, diversity and differences of opinion and truth, aside from describing honesty, loyalty and discipline, kinship and friendship, patriotism and tolerance, smart and practical, empathy, confidence and militants. Orange, representing dynamic attitude, cheerfulness and creativity and innovation. INDONUSA Esa Unggul University is a leading university in Jakarta under the auspices of the Kemala Bangsa Education Foundation. In the present, the university has succeeded in placing its position as one of the best in Indonesia. In the future, INDONUSA Esa Unggul University plan to develop various advantages to achieve its vision, namely “To become a world-class university based on intellectuality, creativity and entrepreneurship that excels in the quality of management in terms of education, research, and community service”. At the same time, this vision will lead INDONUSA Esa Unggul University to grow into a solid, advanced and sustainable institution. Develop quality and relevant education. Creating a conducive academic atmosphere. Creating character leaders who are highly competitive in facing local and global challenges. The program to improve the academic quality of students and lecturers, services, facilities and infrastructure, research and community service and the quality of graduates are the main priorities to become a World-class University. However, the strategic environmental challenge also requires INDONUSA Esa Unggul University to always make adjustments and innovations in values, work culture and work ethic. Corporate Brand Identity which is reflected in the name and logo of the university is a strategic part of this vortex of innovation. The idea of changing names and logos began in 2007, beginning with an internal discourse and opinion poll. Furthermore, socialization was carried out to stakeholders and ended in the logo competition. 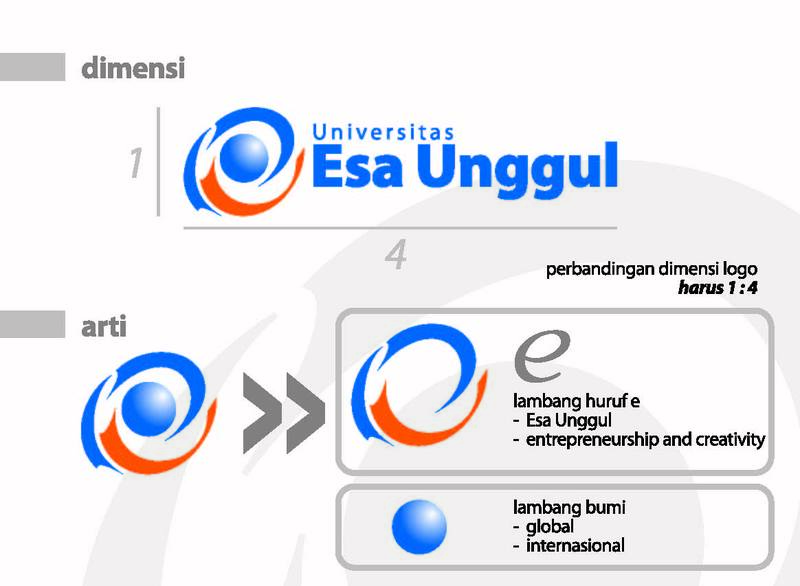 Finally, in 2010 the name of INDONUSA Esa Unggul University changed to Esa Unggul University, with a new logo and a new motto: Entrepreneurship and Creativity. In summary, this logo is illustrated by the exposure to the letter “e” (Esa) and the letter “u” (Unggul), formed by 3 curved lines that revolve around a blue ball. This constellation symbolizes the dynamics of the university to penetrate the establishment, achieving its noble ideals . The existence of a blue ball emphasizes the focus on achieving reputation at the international level. A beam of light on a blue ball illustrates the university’s contribution to the progress of society and humanity. So, as a whole, the new logo reflects the essence of the university’s strategic plan to build a better organizational culture. The Strengthening of Corporate Brand Identity will also increase public trust and appreciation of the achievements and reputation of the university. The university’s journey for almost 25 years has truly provided lessons and traces of experience that are very valuable and proved to be the best offerings for the nation and state.